What is the big question: Is it to ask how to secure engagement in business for profit where there is not much glory to be found or how strong can engagement be? Talking about engagement makes us feel good. Engagement expresses nobility because it is the result of the connection of abilities deployed to work for a purpose, usually espoused by a leader. But high levels of engagement require high levels of trust and that is scarcer in lower income societies, requiring a specific strategy to compete. How strong can engagement be? Let us first focus on the engagement necessary to put one’s life at stake, as in war. Napoleon was only promising an elusive and fleeting glory to people that would risk their lives to follow him; now, that’s engagement. We saw similar levels of engagement in many armies, like in the Latin American militias I portrayed in Gaucho Dialogues or like those of Chandragupta Maurya and his grandson Ashoka Maurya. The big question is how to secure engagement in business for profit, where there is not much glory to be found. Alignment through pay, in cash or shares, is the common recipe, but pecuniary alignment has not rendered more than mercenary organizations, with the ensuing poor level of engagement. So poor, that Gallup claims that worldwide almost 90 percent of workers are not engaged. And yet, we see a high level of engagement in organizations like the Brazilian Samba Schools and in the Dabbawalas of Mumbai. In neither of them, we have pay differentials or bonuses. Perhaps pay, after all, is not all. So, what renders high levels of engagement? Trust does. There are different elements in trust. Trust is bestowed on the beneficiary as deserved through evidence of the leader’s behavior — for example, by not behaving opportunistically and harming those who have deliberately accepted to become vulnerable at the hand of the leader. But trust is not evenly granted across the world. 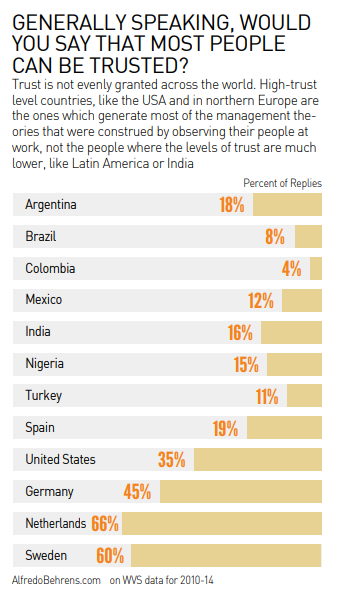 High-trust level countries, like the USA and in northern Europe are the ones which generate most of the management theories that were construed by observing their people at work, not the people where the levels of trust was much lower, like the countries in Latin America, Africa, India or the Middle East, see the graph below. 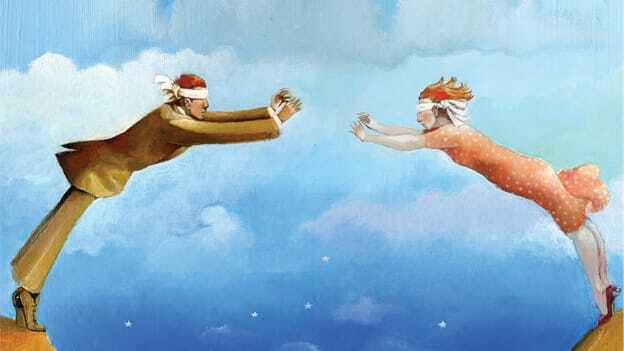 Where generalized trust is low, hiring individuals and developing trust takes long. This is why businesses expand along family networks. Families provide the environments where time has allowed sufficient trust to be developed through personal disclosure and the sense of inclusion. This involves the time-consuming sharing of information of a more personal nature, including information which might be relevant for work-related activities, as beliefs, feelings, concerns, hunches and others, all denser in emotions and which would take longer to be disclosed to outsiders in an untrusting society. That is why high-trust level societies like the northern European ones have an advantage. In such societies, corporations grow fast, even beyond family networks, because there is a lesser need for costly controls to stamp out opportunistic behavior. Trusting environments favor the development of autonomous initiatives and agility in responses. That is why, costly, risk-prone initiatives like innovation are more readily undertaken in trusting environments. Our societies will not turn into high-trust ones overnight. That will come with more effective administration of justice, less discrimination and more — all need to be pushed for, but all will take time. While that happens, we can creatively borrow from fruit growers and graft root corporations with existing high-trust networks. Hire existing teams rather than individuals. Hire through internal references if you cannot hire teams. The corporation will then give known fruits sooner at lower control costs. For higher engagement, do what the Dabbawalas and the Jain diamond traders do — hire along clans, where trust is already high. Then, give clan leaders the autonomy to take pride and ownership in their undertakings. High engagement will follow.